“Hei matahari, setan api kehidupan. Hei matahari bola api kematian. What is Matajiwa? Physically, it is Anda Perdana, one of the last gems from the 90s era, a truly soul powerhouse with genuine attitude. With Anda, sits Reza Achman equipped with his unorthodox drumming – drumcussion is how he defined it. Debris of geniuses in one band, that’s what it is. As a musical entity, the duo unfolds many crossroads and confronts edges into one conclusion of persona, which sounds primitive and in the same time, innovative. Take my favorite song “Inti” for instance, backboned with alternative notions and bluesy build ups but delivered with a peculiar rhythmic choice. “Rhythm Shepherd” Reza intentionally handicaps his set, replacing the rather important drum kicks with some serious percussion business. The well-played marriage between bluesy Anda, experimental Reza and overflowing spontaneity leaving a sceptical music enthusiast like me wanting more and more. Matajiwa was so close to becoming gawky but the distinctive musicality between Reza and Anda refreshes the band perfectly. Songs like “Satu” tricked me into thinking that the song is just another reggae attempt decorated with weary lyrics about unity and predictable sing-along bits, until at some point the song literally climaxed with totally out of space ornaments. That is something that comes out from experience, kids. 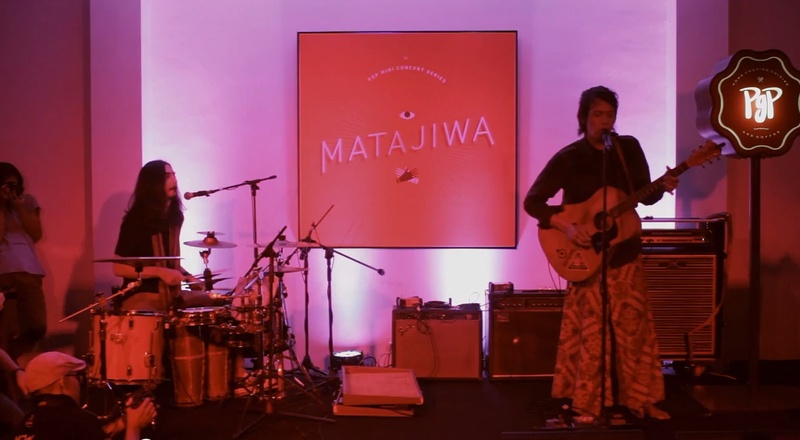 Speaking about experience, in a way the quality that came from Matajiwa is not surprising, since both of them have surfed long enough in the game to peel off the essence of good music. Anda Perdana, son of a legendary entertainer Koes Hendratmo was once part of the 90s rock scene with his band Bunga, turned into instant pop-act in early 2000 soundtracking the monumental movie “Ada Apa Dengan Cinta” and released one solo album in 2008 before finally landed his impeccable voice with Matajiwa. His “old friend” Reza Achman was a beat wanderer resided in Sydney since 1994 and finally moved back eight years ago to Jakarta. During his stay in Australia, it was his experimental project with eccentric musician Sawung Jabo – “Genggong” – that fuelled his curiosity to dig deeper into rustic percussive sounds. With Genggong Reza toured the country and received international acclaim for his distinctive approach of drumming. While musically Matajiwa’s concept is quite tangible, their standpoint about the ideology of the band itself revolves in something vague: realness of human interaction. When everyone is swamped with the digital culture and connectivity, they want to offer another way to “communicate and relate to each other”, said Anda in one interview. In between press coverage and media interviews, both Reza and Anda showed reluctance of elaborating the grand design of Matajiwa idea into words. But I don’t think the world needs them to blabber too much about meanings and definitions because watching them playing live already cover every aspect that you need to understand from the duo. It is Experience, Expression and Experiment. People, Sounds From the Corner presents: Matajiwa.